Control Solutions' Babel Buster Pro is a hardware device - a network gateway - that includes several SNMP functions including Trap Receiver. The Babel Buster Pro trap receiver has the ability to turn traps into Modbus register values and has the ability to automatically take further action based on the trap. "I need to switch something on when a trap is received." Taking action with physical results is a common requirement that is not met by many software products called "trap receivers". The Babel Buster Pro has the ability to take action. Simple responses can be created just using rule templates in the Babel Buster Pro. More complex actions can be created by writing your own program using the Script Basic built into each Babel Buster Pro. The actions taken in response to SNMP traps result in data being placed in Modbus registers. This data can be shared with other Modbus devices, such as a PLC or Modbus I/O device. 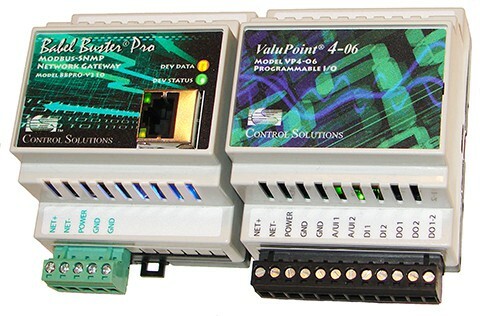 The ValuPoint VP4-0610 illustrated here along side the Babel Buster Pro-V210 is one example of an economical Modbus I/O device that can be used to switch something on or off in response to SNMP traps. The Babel Buster Pro gateway will translate traps into Modbus register values. Another Modbus master can read the registers in the gateway. The gateway also has the ability to be Modbus master itself, writing data to registers in other devices. Therefore, regardless of whether your PLC is Modbus master or slave, your PLC can now have access to data received in SNMP traps. Therefore, your PLC can monitor SNMP traps. Follow these links to read more about the Babel Buster Pro models. Babel Buster Pro for Modbus is available in two styles. The Pro-V210 is DIN rail mounted, and the SPX Pro is panel mounted. The functions of both models are identical. You will find detailed information for each model, including User Guide and introductory videos.